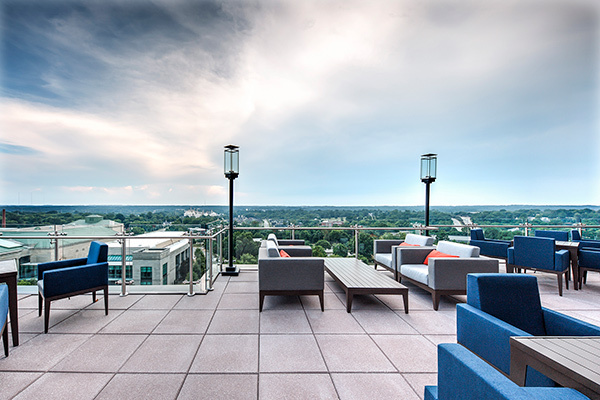 The Residence Inn Raleigh Downtown, a Clancy & Theys project, was recently awarded the coveted Leadership in Energy and Environmental Design (LEED) Silver certification. LEED is the most widely used green building system rating in the world and is a globally recognized symbol of sustainable achievement. The approximately 144,000-square foot hotel opened in 2017 and is equipped with all the typical Residence Inn amenities, in addition to two street-level restaurants, a rooftop bar and pedestrian access to an existing parking garage. 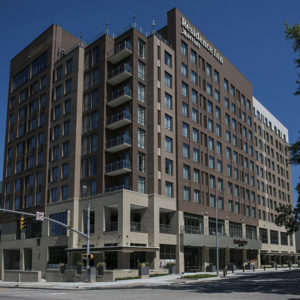 Situated on a 0.52-acre lot on South Salisbury Street in downtown Raleigh, the 10-story, 175-room hotel is popular among those attending events at the nearby convention center. During construction, Clancy & Theys’ Virtual Design and Construction (VD+C) team was able to address the heavy traffic in the area by modeling the utilities to identify conflicts, allowing them to tackle any potential issues prior to beginning underground utility work. The hotel is owned and managed by Summit Hospitality Group of Raleigh, which owns and operates 18 hotel and restaurant properties in North Carolina. Clancy & Theys is thrilled to help Raleigh accommodate its growing tourist population in a sustainable way. As always, we are proud to have been awarded LEED certification, and we will continue to work toward this achievement on future projects.